Almost every successful conversion optimization falls into one of two categories: increasing intent or increasing ease (reducing friction). This makes sense intuitively because as a user goes through a flow, their intent changes over time as they hit more friction, until either they complete the flow or have too little intent to continue. Identifying whether intent or ease are opportunities is key to successful conversion experimentation. The Intent/Ease framework can be applied to all sorts of conversion flows, but in this blog post I will use sign up conversion as an example. Intent is how much the user wants to convert. When users land on a certain page, they have varying levels of intent. For example, a user might have heard great things about your product from a friend and already wants to sign up, meaning they have high intent. Another user may have read a news article about the product launching and just be curious about what it was, and have low intent. For most landing pages, usually you have a mix of high, mid, and low intent users, but it usually is not balanced. For example, home pages generally have high intent users because it's usually the page people land on when they hear about a product from a friend. Paid marketing landing pages generally have lower intent especially if you use ads that "interrupt" user experiences. Once you determine what the most common intent level user is for your page, you want to build a conversion flow that caters primarily for your main user intent level, but still performs decently for your less common user intent levels. If your most common intent level is high, then there probably is not much opportunity in increasing intent through tactics such as education. In this case, working on ease might be a bigger opportunity. If most users coming have low intent, intent is generally a great area to try to optimize. Ease is pretty straightforward - how easy it is for a user to go through a conversion flow. For most products, you may find that a new user may spend only a few minutes or even seconds on your site before authenticating or bouncing. So, it's important that a user can authenticate within that short period of time. A lot of "growth hacks" fall under this category, such as making flows shorter, reducing fields, making buttons more prominent. You should go through your user flow to see how easy it is. Make sure to try out common user mistakes such as forgotten email, typos, etc. You'll likely be able to determine a few improvements this way and get a better sense of your current conversion flow ease. Once you understand your intent distribution and conversion flow ease, you can combine them to figure out which strategies to use. The one is that is more lacking is the one you should work on first. For example, if intent is pretty high from word of mouth, but signing up is difficult due to the long process, increasing ease is probably the bigger opportunity. On the flip side, if signup is already easy but overall conversion rates aren't great, increasing intent is probably the bigger opportunity. If both intent and ease are high, which is the case for some home pages, you may be near a maximum conversion rate where there are bigger opportunities elsewhere. The Pinterest home page is an example of a page where there is high intent. Most people reach the page either directly after hearing about it, or by searching "Pinterest" on Google. So, we've focused on ease here, making signup/login the only thing you can do on the page. When we add distractions, authentication rates tend to go down. Education has minimal effect because users already have high intent. 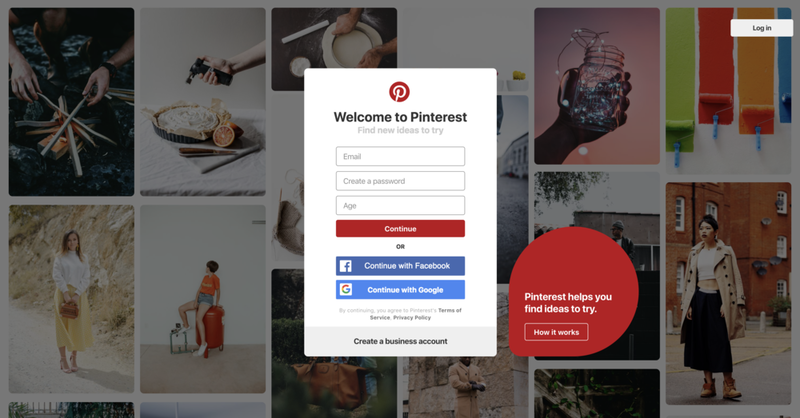 The Pinterest board page is an example of a page where there is lower intent because most users come through related search terms and may not know what Pinterest is. We've tried different value props such as saving, exploring, and content, and found that content was the value prop that enticed users the most, so we've had wins in adding more content, putting the best content first, and describing the content better. Compared to the home page, there was more opportunity here increasing the intent, whereas a lot of additions to the homepage were just distractions from authenticating. To end, here's a quick list of opportunities you can pursue to increase signup conversions, depending on your intent and ease levels. Determine what value prop speaks to the most users and upsell that: Does the product save money or time? What needs does the customer need to be fulfilled? To summarize, first determine whether intent or ease are opportunities, then tackle the area with bigger opportunity first. If you find that you are running a lot of experiments in one area with low success, try the other area. For example, if you run a lot of experiments to try to increase intent, but they have poor results, perhaps users coming in already have high intent. It might be a good idea to work on ease then in this case. By using this framework, hopefully, you will see your conversion experiment success rate go up!